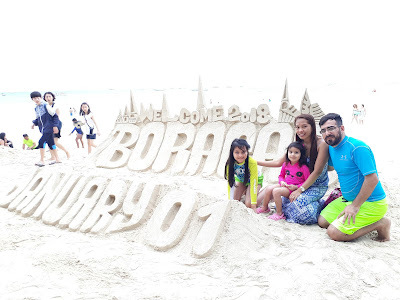 For the first time as a family, we spent the last few days of the year 2017 and celebrated the coming of the New Year in Boracay. I actually grew up in an island very near Bora, but never been to this paradise since birth. I know some people from my province who frequently travel to and fro this place for work. Not to mention my relatives and some neighbors who visit this place anytime of the year and tell various stories about it. Did I ever dream of going to this place before? Not very much because we also have lots of nice beaches in my province in Romblon like this one HERE. 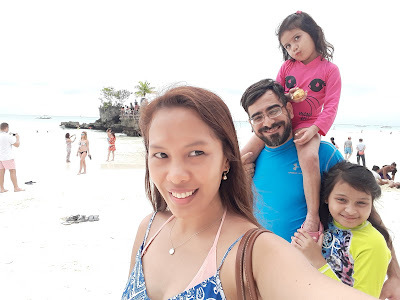 Anyway, I gave in to the thought of spending a few days in Boracay with hubby and kids just so we can say we've been there before. I know, I've been asked a lot of times in the past if I ever stepped a foot in Boracay and I say 'no' then people would feel sorry for me. Not anymore, folks! 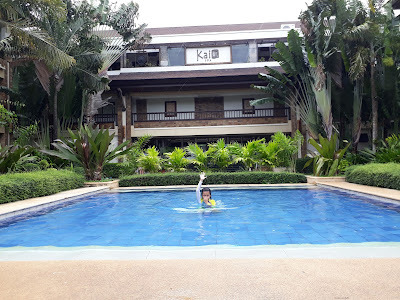 We stayed at for 4 nights at the Henann Regency Resort & Spa at Station 2. Things that I like about Hennan Regency.. The location of the hotel is beachfront and it's next door to D'Mall and lots of bars and restos. They have 4 separate pools and a jacuzzi, one of the pools has a bar. 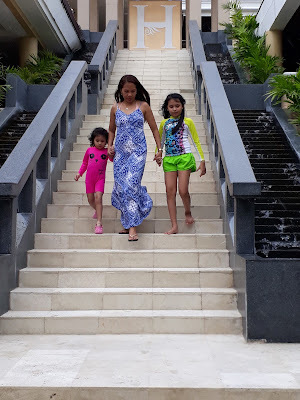 Henann Regency is a very good place to stay for couples and families alike if you want easy access to crowd and the beach. The overall look of the hotel is updated though the layout can be confusing. I suggest keep the hotel map on your 1st day and memorize it to avoid getting lost. They have a gym but not really updated and really small. Some staff are really friendly and polite, others are not. Love the buffet food, the kakanin and the ulam selection in the morning and the meat selection at night are very good. The gala dinner was very nice during the New Year's Eve 2018 party. The live band, the singing chefs and the fire-dancers all nailed it! Things that I don't like about Hennan Regency.. There are only 2 things that I don't like about Henann Regency. First, they don't clean the room regularly. They only make the bed and replace the used toiletries. We didn't notice the dirt right away since we always went back to the room tired and sleepy. On our 3rd night, I realized how dirty they were when I saw the accumulated hair on the floor, smelt the stinky washroom. I felt disgusted yet too late to complain. We'd rather rest and wake up early for our morning flight instead of call for a cleanup and wait for them to finish and retire to bed! About Henann Regency Resort & Spa's customer service..
Hubby got really pissed off when they couldn't give us a table during the gala dinner. We stayed from December 29 to January 2 and as per hotel policy, everyone who had a booking that falls on the New Year's Eve should pay extra for the gala dinner, additional to the basic nightly rate. Alas, the gala dinner came, kids were so excited about the fireworks and all. However, the ladies at the gala tent didn't accept us. Turned out, we didn't reserve ourselves a table. Wait what? Why, Henann? You should have known how much people are checked-in your hotel that night and estimated how many tables to prepare per group in order to accommodate everyone, right? Why do we need to reserve a table when you can easily designate it on a first come first served basis? You charged us extra for the gala dinner so obviously you can expect us coming. Plus, you didn't inform us about table reservation upon check-in. You just told us to reserve a seat for our 9yo to which we paid extra. Who is going to be happy with that kind of service? We were not given a table until hubby started raising his voice, complaining of the poor service. I just kept my cool there cos I didn't want the situation to ruin the entire night. I pity those foreigners who talked to them before hubby. They looked disappointed but couldn't argue more I think because of limited English. They just led them to the usual buffet area for the supposedly special dinner instead of the beachfront gala tent where a live band is playing and a special buffet is waiting. Lesson learned from this booking..
Read all the reviews in booking.com before paying for your hotel. Booking.com has this feature of showing mostly the pros in their review section. Hover until the very bottom page of the hotel at booking.com and you will find the entire content of the review. There you will read both the pros and cons of the hotel as reviewed by the people. Mind you, most reviews talk about the cleanliness as an issue for Henann Regency. Something that I regret not knowing beforehand. So, based on this experience, we will most likely not choose Henann Regency again or any other Henann hotels in the future. I could've booked a better hotel in Station 1 if only hubby didn't insist we stay at Station 2 'where all the fun is' as he described it. Next time, it's either a 5 star hotel like Shangri-la or a no star bed and breakfast nalang para walang reklamo. 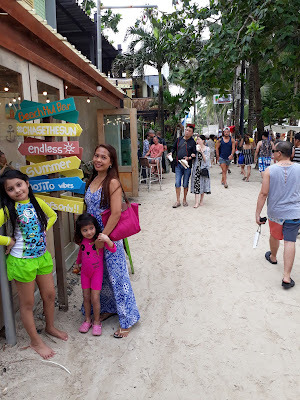 Fun things we did in Boracay as a family.. Things that I liked about Boracay..
-The white powdery beach. Super! -Very near the main island, boat travel is quick. -You can't miss Manila much. Fastfoods and brands are all at Station 2. -The place is alive even at night. So many tourists. Things that I don't like in Boracay..
-Poor sewage system. There some parts of the beach where you could see the stinky kanal flowing to the sea. In general, the beach is great in January but I heard that it gets really dirty during peak time in the summer. Hope the local government do something more this. -Some vendors sell overpriced products. P3000 for a budyong or helmet shell? Wow, ginto! -Tricycle charges double for a ride from the jetty port to anywhere in the island. Our activities sounds a little boring, no jet-skiing or any water sport, ATV around the island, etc. But it was windy and the sky was a bit dark on our first day. On the last day, it was already stormy. Plus, we are a family with 2 young girls. Activities can be very limited talaga esp. 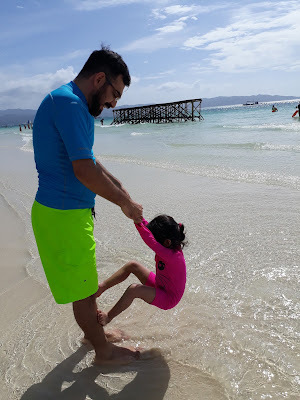 my kids do not like the idea of getting sand in their toes (I know, weird) and they can't swim yet. 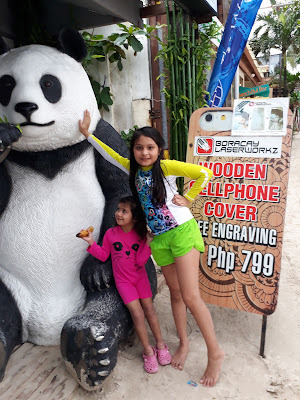 Hope to go back to this place maybe 10 years from now if this place is still okay and when my girls are all grown ups; so we can do more fun things together. 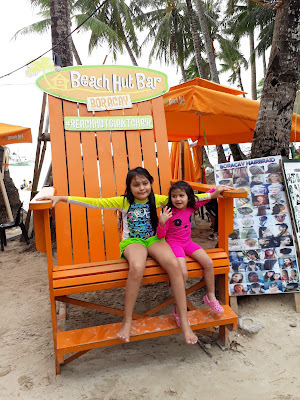 Now, have you been to Boracay, the island paradise of the Philippines? Where did you stay? What are the things you did while on the island?